Take advantage of Out of Step Font Company’s hard work. Their tattoo fonts are already in use by merch designers and flash painters like Dominik Salmic, Davis Rider, and Tyler McFadden for bands like Lionheart, Fit For A King, Seaway, and Major League. Designing lettering tattoos for sale? The Tattoo Font Collection gives you amazing fonts with complete control over the tattoo lettering art you create. Out of Step Font Company was started by merch designers, creating fonts for our own print projects. Now it’s your turn to take advantage of our hard work. The fonts are already in use by merch designers and flash painters like Dominik Salmic, Davis Rider, and Tyler McFadden for bands like Lionheart, Fit For A King, Seaway, and Major League. 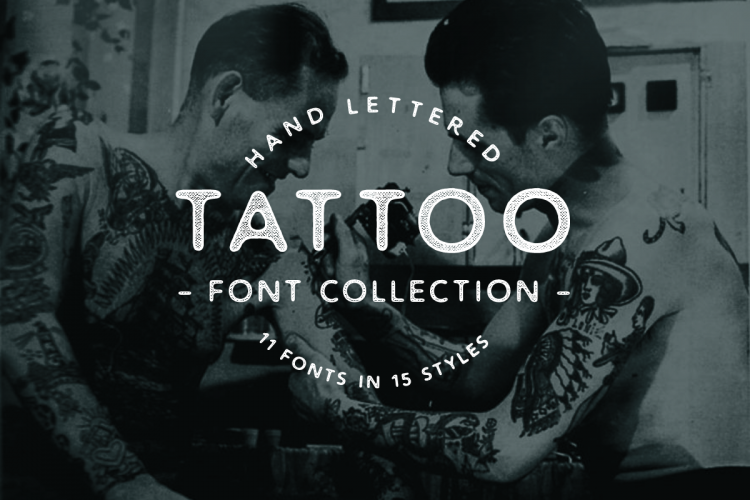 The Tattoo Font Collection includes 11 of the best and most useful tattoo and flash painting fonts, in 15 different styles. The Premium License gives you free reign to sell any designs or products you create with the fonts, so what are you waiting for! Get creating!! We’d love to stay in touch, sign up for the Typeyeah newsletter for great resources, content and offers. Well folks, we come to the end of another year and what a fantastic year it has been! Feast your eyes on the Typeyeah 2018 Instagram Best Nine! Ritchie Type asks artists from all over the world to share their story on how they got involved in their creative journey of typography and hand-lettering.